As works at The Connection progress into 2016, the project is tracking well across multiple fronts. 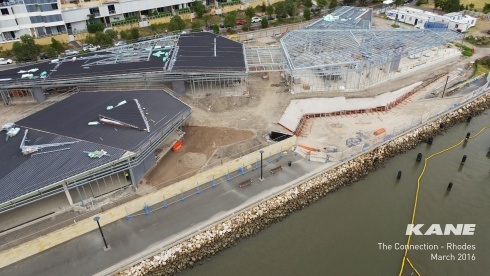 Structural steel erection, including the link canopies, is complete on all four buildings, with the roofing works undertaken on 3 of the 4 buildings. All precast is complete with window subsils beginning installation shortly. Internal walls and studwork have also commenced. With roadworks next on the agenda (March to June)and the wharf structure well underway, the project is really talking shape and beginning to look like the 3D rendered models. Coupled with the ongoing external works the project is tracking well for its August 2016 completion. Take a sneak peek at the drone video here.